Even something as simple as buying a cooling mat for your dog can turn into a daunting task as there are so many options available on the market. To make it easier for you, we have listed the types of cooling mats and their features. This will make it easier for you to choose the one that best fits your dog’s needs. GEL One of the most commonly found cooling mats for dogs is the one that has a gel filling. It is also one of the most preferred ones as they are able to retain coolness for a longer time and do not need too much tending. Gel cooling mats need to be placed in the fridge for a few minutes a couple of times in a day and they will be ready for use again. The coolness of the gel mats will be retained for at least 5 to 6 hours in a day. Plus, they are very soft and comfortable for the dogs to use. However, you have to be careful with the material you choose because if your dog has the habit of teething, it can easily damage the mat. 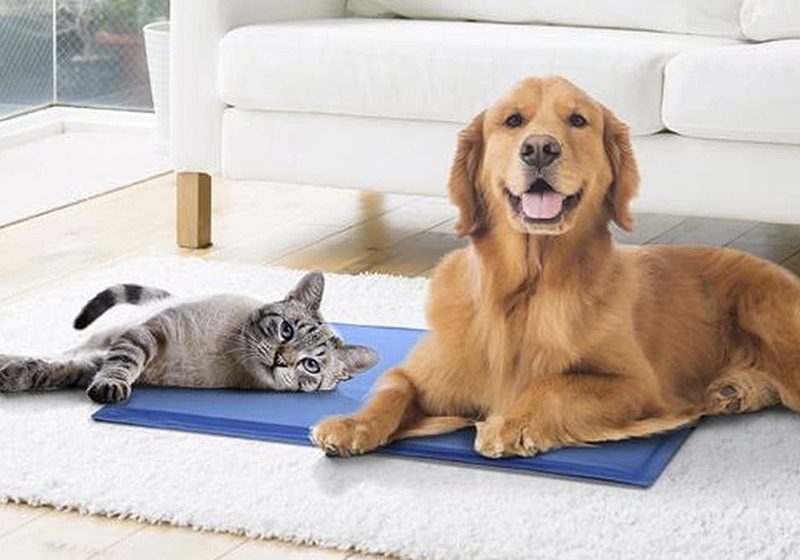 However, the gel inside the mat is non-toxic, so it won’t cause any harm, but in case the dog manages to eat most of it, you may want to take it to the vet. WATERBEDS There are some beds that come with a water filling. These are more durable than other types of mats. The manufacturers agree that they need to be careful when making these mats since a little teething may cause them to leak and eventually the mat will be useless. The mat will need to be refrigerated often as it does not retain the coolness level as long as the gel ones. You cannot freeze these mats as your dog will be unable to use them if they are hard as a rock. The mats are very soft and comfortable for dogs, allowing them to cuddle up as they want. However, you will need to check the size and make sure you buy a mat according to the size of your dog. MEMORY FOAM For older dogs, it is recommended that they are given memory foam mats as they are able to take the shape of the body. This makes them more comfortable and supportive of their weakening joints and other bones. They are also highly comfortable and durable, making sure that your dog gets the best kind of rest. One thing to note about these pads is that they contain micro gel beads which provide the cooling that a dog needs, so it will be able to retain the coolness for a longer time. You won’t even need to stuff it in the fridge or anything; it will regain the coolness once the dog gets off and gives it a little space to breathe. ELEVATED If you have a dog living outside, you might want to consider getting it a cooling dog bed that is elevated. It is much like an elevated dog bed except the mattress in the cooling sort makes sure your dog’s body does not heat up during summer. As this dog bed is elevated, it will remain dry even if there is water on the floor. This is especially effective if it rains. The bed is highly durable and made to last for a longer time. Your dog will love the comfort and coolness it provides, especially if it is the sort who does not like sleeping on the floor.